A pilot study in Development and Psychopathology concluded that teenage girls who engage in self-harm like cutting often have brain features like adults with borderline personality disorder. Often is relative, since this was only 40 individuals. Cutting and other forms of self-harm are warning signs for suicide, which data from the Centers for Disease Control and Prevention say increased 300 percent among 10- to 14-year-old girls from 1999 to 2014, according to data from the Centers for Disease Control and Prevention. During that same time, along with a 53 percent increase in suicide in older teen girls and young women. 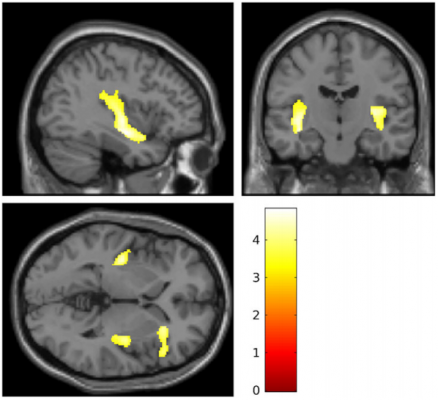 In adults with borderline personality disorder, structural and functional abnormalities are well-documented in several areas of the brain that help regulate emotions so this study used a younger population to try and hone in on warning signs; 20 teenage girls with a history of severe self-injury and 20 girls with no history of self-harm. Each underwent magnetic resonance imaging. When the researchers compared overall brain volumes of the 20 self-injuring girls with those in the control group, they found clear decreases in volume in the insular cortex and inferior frontal gyrus. These regions are next to one another and are two of several areas where brain volumes are smaller in adults with borderline personality disorder, which, like cutting and other forms of self-harm, is more common among females. Obviously not all girls who harm themselves will go on to develop borderline personality disorder, a condition which is difficult to treat because its definition is so broad. And there is no causal link between cutting or other self-harm and full-on suicide, but the 'she is just doing it for attention' dismissal might be opening the door to something more serious. “If we can learn more about how adults with psychiatric disorders got there, we are in a much better position to take care of people with these illness es, or even stop them from happening in the first place,” said Ohio State University psychology professor Ted Beauchaine in their statement.